CYRANO! swashbuckling drama at Derby Theatre. 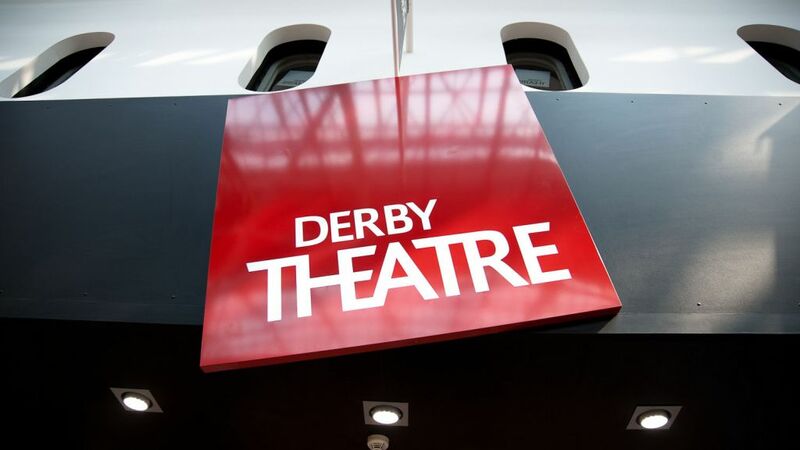 16 -20 May – East Midlands Theatre. Multi-award-winning Northern Broadsides have joined forces with the highly acclaimed New Vic Theatre, Newcastle-under-Lyme, to embark on a UK tour of Cyrano, an exciting new adaptation by award-winning playwright Deborah McAndrew (An August Bank Holiday Lark) of Edmond William classic romantic comedy Cyrano de Bergerac, and it will play at Derby Theatre from Tuesday 16 until Saturday 20 May. 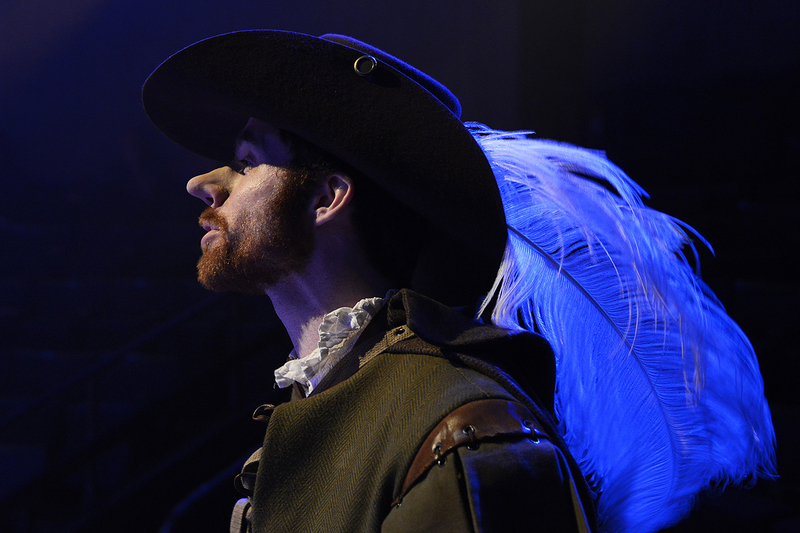 Directed by Northern Broadsides Resident Director, Conrad Nelson, Cyrano is a brilliant poet and dashing musketeer who is deeply in love with the beautiful Roxanne. Afraid of revealing his feelings – for who could love a man with such an enormous nose – he woos her from afar with heartfelt declarations of love, delivered to Roxane from the mouth of the handsome Christian. Cyrano’s exquisite poetry captures her heart, but is it Christian or Cyrano who wins the prize of love? Set in the golden age of musketeers, Deborah McAndrew’s lively new adaptation brings fresh vigour to this swashbuckling tale of unrequited love. Add to this Northern Broadsides’ musical panache, acclaimed charisma and exuberant performance style, and you have a delightful evening of pure drama that will lift your spirits and make your heart ache. 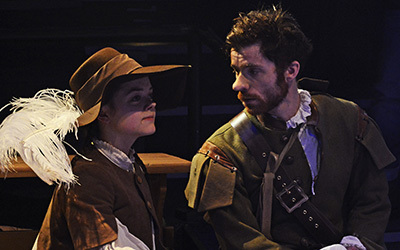 The cast for Cyrano includes Adam Barlow, who plays Christian (who last appeared at Derby Theatre in Lee Hall’s Cooking with Elvis) and Francesca Mills (who appeared at Derby Theatre in 2016 alongside Warwick Davis in the wonderfully funny and much-loved farce See How They Run presented by The Reduced Height Theatre Company). Other cast members include: Angela Bain, Paul Barnhill, Andy Cryer (an actor who also appeared in many productions during the Derby Playhouse days); Jessica Dyas, Christian Edwards, Michael Hugo, Anthony Hunt, Perry Moore, Sharon Singh, Robert Wade and Andrew Whitehead. Tickets: £15.50 – £26.50, concessions available. For more information and to book tickets, call the Box Office on 01332 593939 or book online at Derby Theatre. In Good Company ‘Departure Lounge 2017’ exciting news.